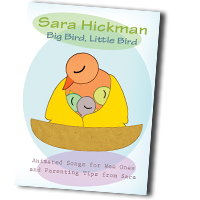 I just love the DVD that I got to review of Big Bird, Little Bird, by Sara Hickman. She is a very talented singer and songwriter. Her voice is very soothing, and her songs are fun. Watching this DVD with my kids is fun because we talk about how important and special they are to me. Sara's songs talk about what wonderful children we have in the words of her songs. Her DVD is perfect to put in after supper time when you are settling your kids down for the night. The animations in the Big Bird, Little Bird DVD are simplistic and easy for small children to follow. The flowers, clouds, and trees dance and sway to the music and singing. "Big Bird, Little Bird" features 13 soothing songs for children ages newborn to five. The songs explain what a family tree is, what the goop in your eye is, and all things bright and beautiful in a musical and visual art setting. The songs included on the DVD are “It’s Alright (acapella), “A Slice of Heaven,” “Goop’s In It,” “Big Bird, Little Bird,” “Lily,” “This Heart,” “You Are My Sunshine,” “The Family Tree (You and Me),” “All Things Bright and Beautiful,” “We Are Each Other’s Angels” and “It’s Alright.”(with strings attached). The DVD also includes 15 short parenting tips – hosted by Hickman, a certified parenting instructor – offering ideas on what to expect as they enter the glorious challenge that is their newborn’s life. Tips include “Nursing,” “First Hello,” “Introduce Your Baby,” “Being Polite,” “Being on the Same Level,” “No-No to Pacifiers,” “G.E.M.s,” “Feeling Frustrated,” “Early to Bed, Early to Rise,” Consistency is Key,” “It’s a Whole Other World,” “Going to the Store,” “Family Ritual” and “Rap Up." I recommend this DVD to your family! We enjoy it, and think that Sara Hickman created a great DVD for families with small children. Check out Sara's site HERE. I received this DVD for reviewing purposes from Lionsgate and HIT Entertainment. I was not compensated for my time or written review. They have provided me with the DVD's and information to share with my readers. The opinions in this post are of my own, and do not reflect the companies or DVD.